Controller grips. For improved gamig sessions. 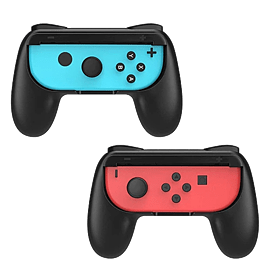 Includes 2x grip holders for Joy-Cons. Ergonomic design for a comfortable gaming session, reducing hand fatigue. Anti-slip grip, resistant to wear and tear. Quick and easy installation - snap in and play. Full access to ports and buttons. Protects your Joy-Cons from bumps, scratches and dirt.